Still and moving images are the only ways of getting close to representing a memory of dance and it is only with the relatively recent development of recording techniques that the moving image has reliably captured artists in performance. The still image has been around for a lot longer, long enough, for example, to admire the series of photographs of Vaslav Nijinsky by Baron Adolphe de Meyer begun in 1911. In his sumptuous book of these photographs, Nijinsky Dancing, Lincoln Kerstein claims ‘Nijinsky is in fact the first dancer in history who seems to have collaborated consciously with a photographer on the level of art.’ Until the arrival of the 35mm camera and more sensitive film, the studio was where dancers and photographers would collaborate on a shared aesthetic but as soon as the technology was available dance photography turned its attention to the performance shot. Photographs of Royal Ballet dancers over the years show both kinds of images by such notable photographers as Gordon Anthony, Cecil Beaton, Anthony Crickmay, Michael Peto, Zoë Dominic, Keith Money, Lord Snowdon and Leslie Spatt while today you are likely to see glossy performance shots in the program by Johan Persson or Bill Cooper while in the contemporary sphere Hugo Glendinning and Chris Nash have developed a distinct style of expressive dance portrait that borrows from both performance and the studio. 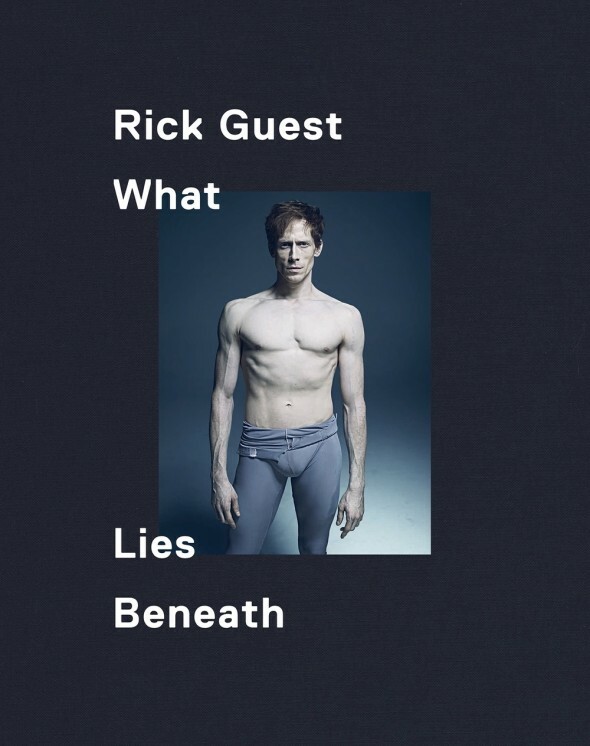 But at the end of last year fashion photographer Rick Guest released two self-published books of dance photography that eschews the performance for a more personal approach. Guest was introduced to dance by his wife some 15 years ago — he remembers Irek Mukhamedov in MacMillan’s Romeo and Juliet — and found his way back to The Royal Ballet with a commission to photograph principal dancer Edward Watson. From this grew the first book, What Lies Beneath, for which Watson is the muse and in which Guest’s fascination with and admiration for the dancer’s ethos finds expression in large-format portraits of an extended cast from The Royal Ballet, English National Ballet, the Danish National Ballet, Dresden’s Semperoper Ballett, Wayne McGregor’s Random Dance and Richard Alston Dance Company. To concentrate his (and our) attention on the person Guest removes the locus of these photographs. All that outwardly signifies the dancer is the clothing, which is a study in itself: tattered, worn-out warmers that hang, it has to be said, with remarkable effect on these honed bodies or lovingly stitched repairs on a favourite unitard — as in the portrait of Melissa Hamilton that reveals the unequivocally trained body beneath its delicately scarred covering. In stripping the dancers of their performative role Guest reveals the enigmatic presence within. They are suspended not spatially (there are some fine examples of those, notably of Sergei Polunin suspended on an invisible cross) but psychologically; some have the confidence to be themselves in front of the lens, others feel the need to pose, giving the photographer their ‘best angle’ or baring their extraordinary physique for all time. But many are revealing of a quality that transcends description, of a neutral mien that is like the clay before it becomes a sculpted form (notably Svetlana Gileva and Julia Weiss of Semperoper Ballett). In other portraits there is an earthy quality that contrasts with the stage presence. Marianela Nuñez has a weightless, ethereal quality on stage but here she is quintessentially a woman with gravity in images whose locus is somewhere between the living room and the studio. The dancers return our gaze — the gaze of the photographer — in response to a dialogue we cannot hear. Watson, like Hamilton, allows the gaze in, without any sense of defense. Eric Underwood looks into it as in a mirror; Yenaida Zenowsky and Yuhui Choe match it enigmatically, Alison McWhinney wistfully; Sergei Polunin meets it head on and Olivia Cowley gently deflects it. In Tamara Rojo’s reflective pose her eyes look away and down, preoccupied with her own world that is encapsulated within her superbly honed lines. It is interesting to compare the physicality of dancers across the different companies — the effect of respective repertoires, physical conditioning and company culture. At Semperoper, for example, the dancers’ bodies appear more at ease and their clothing neatly utilitarian yet the traces of their profession are still apparent. What Guest has captured, essentially, is the way embodied classical training and the experience of performing express themselves in the eyes, in the posture and gesture of the dancer’s body. At the current exhibition of Guest’s photographs at the Hospital Club in Covent Garden, where the portraits are almost life-size, it is the eyes that engage directly with the lens and the spectator so they seem to follow you around the gallery. In 2010 Guest saw Jane Pritchard’s Diaghilev exhibition at the V&A where his interest in fashion overlapped with his fascination for dance. The second compilation of photographs, The Language of the Soul, includes the same dancers as in What Lies Beneath but in more active poses partnered with his familiar world of fashion. ‘Some of the images are pure dance, some more fashion and some more photographic in nature,’ he writes. In both the dance and fashion portraits there emerges, unlike in What Lies Beneath, a performative quality which in certain cases is transformative. There are no ‘old ladies’ of either gender in the book, but some of the portraits reveal this transformative ability, notably in Sergei Polunin. He is singing in his portraits; he has something to sing about and so does his body. He becomes someone else. It is also good to see the performance photograph of Johannes Stepanek in an image I have seen in a Royal Opera House program without finding a credit. The more I look at the photographs in these two fine compilations the more I am drawn into them. It is too easy to take the performance image for granted: to acknowledge the dancer without seeing the person. What Guest does is to first decontextualize the dancer and then to show each one in a refreshingly unfamiliar light with the immediacy of bringing the viewer into the same room to share his sense of admiration and awe.